K-Squared Entertainment joined forces with Tennessee Performing Arts Center under the leadership of President & CEO Kathleen O'Brien for a developmental production of Part of the Plan. Nineteen performances of the new musical played in TPAC's James K. Polk Theatre in September, 2017. Part of the Plan SWEPT the 2017 Broadway World Regional Awards with 15 wins including BEST NEW WORK and BEST MUSICAL. 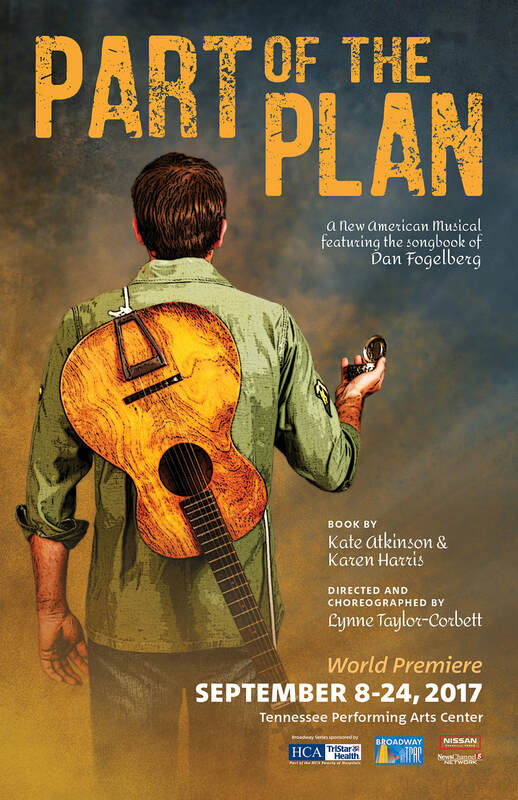 "Part of the Plan" is a New Musical – an original story scored with the music and lyrics of the late, celebrated, singer-songwriter Dan Fogelberg. The book, written by Kate Atkinson & Karen Harris, follows three decades in the lives of an adopted boy and the teenaged girl of privilege who was forced to give him up. Our vision is to present a powerful story, told with heart and passion, seamlessly interweaving the music and lyrics of an authentic American Troubadour. "Part of the Plan" brings Dan Fogelberg's music to a generation who may not know his work, to those who may have forgotten his artistry, and to the die-hard fans who long to hear his music in all forms.